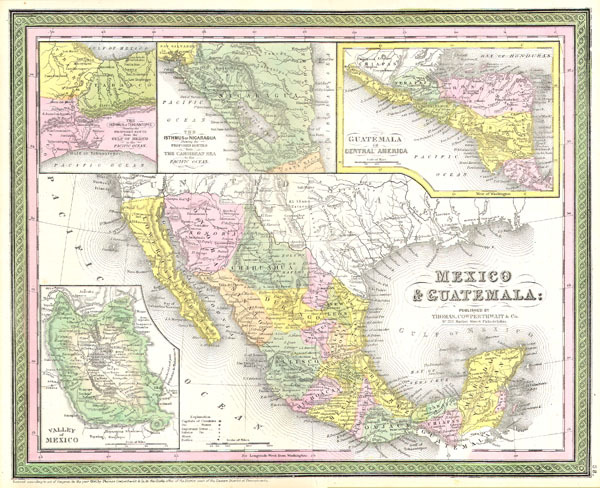 This scarce hand colored map is a lithographic engraving of Mexico. Roughly covers the territory of modern day Mexico and Texas. Inset maps depict the Valley of Mexico, today's Mexico City and Estado de Mexico (Mexico State). Inset maps along the upper border depict the Isthmus of Tehuantepec, the Isthmus of Nicaragua, and Guatemala. The whole is shows both political and geological features and is rendered in the lovely pastels typical of 1850s Mitchell / Cowperthwait maps. Dated and copyrighted 1850. Fine or perfect condition. Blank on verso. Wide clean margins.